I’ve been meaning to get back to the windmill for a long time. The thousand words a day writing challenge, 100k in 100 days, is pushing me to do it today. That’s what writing challenges do. 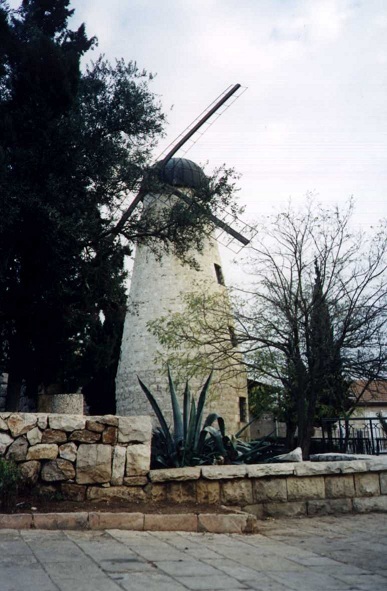 Yes, the old windmill was undergoing renovation to turn it back into what it used to be – a working windmill. 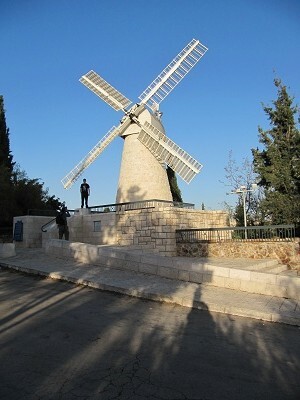 I also mentioned that the windmill, built in 1857 by the British Jewish philanthropist, Sir Moses Montefiore, was hardly used, mainly because Sir Moses and friends failed to take local conditions into account: there was not enough wind on most days to turn the sails. That’s the story I’d always heard and read. It’s the one I heard told yesterday by a guide to a group of tourists on Segways while I photographed and wrote about the view. But when I was in London last summer, I heard a different and more colourful explanation of why the mill was hardly used. I joined a tour of the Jewish East End, the East End as it used to be at the beginning of the last century. I was particularly interested because my father grew up there, but the tour was fascinating and anyone interested in history would enjoy it. Our guide, Judy, was excellent. We learned many things – even the origin of the word: curfew. Towards the end of the tour, we entered the Bevis Marks Synagogue to hear from another excellent guide, Maurice. This one, while telling us all about the history of the synagogue, pointed out the seat that used to belong to Sir Moses Montefiore, who, it turned out, was responsible for initiating and provided funding for various projects around the world. 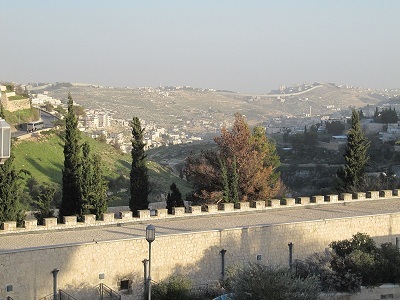 One such project was to set up the two adjoining neighbourhoods of Mishkenot Sha’ananim and Yemin Moshe, among the first to be built outside the city walls. Yemin Moshe was named after him, Moshe being the Hebrew for Moses. This is the story that Maurice told – an alternative to the “lack of wind” story. Despite the challenging modes of transport available at that time and his advancing age, Sir Moses Montefiore frequently travelled to the holy land. On one visit, the residents of Yemin Moshe told him of their difficulties in obtaining flour. There were several flour mills in the area, but they had all hiked up their prices recently and the people couldn’t afford them. Montefiore announced that he would build a number of windmills to grind flour and that he would give away the flour to the residents. 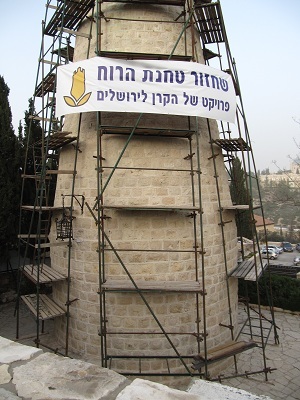 He had the first one built in Yemin Moshe. The mill began to work, the people received free flour and the other flour mill owners panicked and reduced their prices. Having achieved his goal, Montefiore didn’t need to build any more windmills and the one he did build was no longer needed. I don’t know which story is true, but the second one turns Montefiore from a fool into a very clever man, and I don’t think he could have done all that he did and be stupid. A great story and more plausible than lack of wind. A smart man indeed, we could do with few more like him. Yes. I like the way he put his vast wealth to good use. I must admit I rather like the story of building the mill to “discourage” the abuse of supply and demand. It looks great restored. A great story. 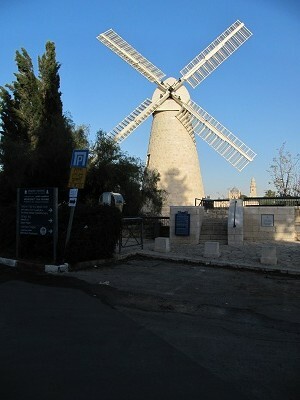 I’m glad they restored the windmill. I read that there’s a place in Transylvania that has a mill the locals refuse to restore because they are afraid of it. Something about a vampire living there. It was quite interesting.